Leadership can be seen as a social skill which encourages strong followership. It is associated with emotional intelligence factors such as attitude, confidence, respect, and trustworthiness (Fehd, 2001). Through positive actions, leaders foster the success of others and encourage beneficial human-to-human relationships. They have the ability to disarm negativity and work toward stronger goal achievement. Leaders work around a shared vision. It is the selling of this vision that truly helps people to adjust their behaviors toward a specific end. It is often necessary for leaders to engage in collegiality to create collaboration that allows for enough subordinate power to become part of the vision realization process (Singh, 2008). As employees begin to understand the vision and create synergy toward its achievement releasing additional power can act as both a reward and an efficiency generator. Leadership is about influencing others. There are many options of power usage but those that can influence others create self-perpetuating growth. Leadership involves the influencing of others to act toward the attainment of a goal through the use of social relations versus simple structural constraints (Hellriegel, et. al., 2006). In such situations administrative activities should enhance social leadership but not be the foundation of such leadership. When administrative leadership is restrictive and limiting it runs the risk of discontentment and breakdown. Superior performance is often seen in the realm of skills but this doesn’t explain in meaningful depth previous success stories. According to Singh & Manser (2008), around two-thirds of competencies linked to superior performance are emotional and social qualities that exist in the realm of self-confidence, persistence, empathy, flexibility, and the ability to work with others. Therefore, leaders can perform when they are cable of understanding and working with the various human elements by relying on their high emotional intelligence. This leaves some wondering what emotional intelligence is. According to Caruso (1999), emotional intelligence can be clarified as, “EI is the ability to use emotions to help you solve problems and live a more effective life. Emotional intelligence without intelligence, or intelligence without emotional intelligence, is only part of a solution. The complete solution is the head working with the heart” (p. 26). Thinking and emotion work together to create the highest levels of leadership performance and environmental navigation. Understand and express emotions appropriately. Understand the feelings of others and establish interpersonal relationships. Cope with new situations and solve problems on a personal and interpersonal nature. Be optimistic, positive, and self-motivated toward goals. Professor Prakash Singh argues that to move the bottom line of employees from dependency to independence requires the ability to bring them into a shared vision of reality. Administrative structures are designed for management/control purposes but interpersonal leadership is designed to bring people willingly into productive actions. The ability to communication, create trust, foster relationships, provide a level of empathy, and manage conflicts as they rise is important for encouraging people to see a more productive perspective. When the emotionally and socially intelligent leader builds relationships around a vision, employee satisfaction level rises. Previous research has indicated the employee satisfaction is the drawing in of employees to fulfill grander purposes for the organization. It is a process of being part of something greater than oneself in an attempt to participate in the bounded rationality of organizational objectives. When employees are drawn as individuals into the success of an organization and can contribute in their own unique ways they can raise their performance and skill levels in a way that can be hedged by leaders to enhance the firm. The positive of leadership is like the catalyzing agent that bridges the gap between the administrative factors and the economic-social needs of the employees. Caruso, D. & Salovey, P. (2003). The emotionally intelligent manager. San Fransisco: Jossey-Bass. Fehd, L. 2001. Emotional intelligence: An executive handbook. Austin: Good Pages. Hellriegel, D., Jackson, S.E., Slocum, J., Staude, G., Amos, T., Klopper, H.B., Louw, L. & Oosthuizen, T. (2006). Management. Oxford: Cape Town. Orme, G. & Bar-On, R. 2002. 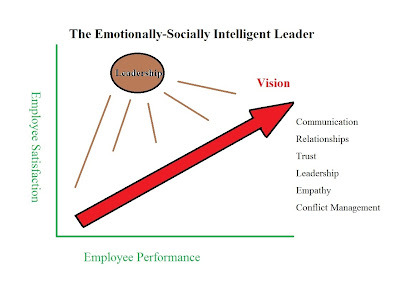 The contribution of emotional intelligence to individual and organisational effectiveness. Competency and Emotional Intelligence, 9, 23-28. Singh, P. (2013). A collegial approach in understanding leadership as a social skill. International business & economics research journal, 12 (5). Singh, P. & Manser, P. (2008). Correlation between the perceived emotionally intelligent interpersonal behaviors of school principals and the job satisfaction of their teachers. The International Journal of Knowledge, Culture & Change Management, 8(1), 189-200.